There are two wonderful independent bookstores within (somewhat) reasonable driving distance of me. One is quite a bit further than the other so I don't get to it as often but I love the store and the owner so I try to make the trip when I can. If the owner is there, we chat and I like to ask her what books I shouldn't miss. (I do the same at the other store as well, because bookstore owners are invaluable for recommendations, of course.) Since I have a bit of a book problem (ie I buy far more than I should), I can be difficult to recommend to and often the recommendations are just on the knife's edge of what I like to read regularly. The last time I was in, the big recommendation was for a middle grade novel set during WWII. I admit I wrinkled my nose. I almost never read middle grade now that my kids are older and I am feeling worn out with WWII books. But I was told that everyone in the store had read it and raved about it. So I figured I'd take a chance on it and if it wasn't for me, well, I have a niece and nephews at about the right age to pass it along to. 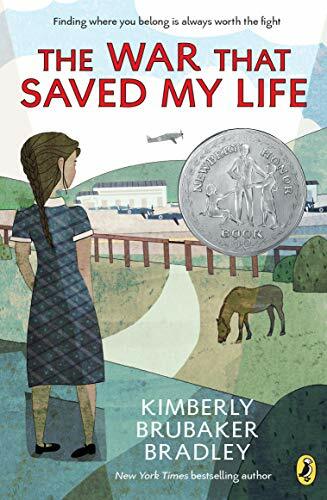 I will definitely be passing Kimberly Brubaker Bradley's The War That Saved My Life along to them but not because it wasn't for me. I'll be passing it along because it is a wonderfully written and engaging look at a very different facet of the war and I think they will thoroughly enjoy it. They have other aunts so I have to try and win favorite aunt status somehow, right? And how better than by passing along a book I'm sure they'll love. Ada is a young girl living in London with her mother and her younger brother. She was born with a club foot and her mother is ashamed of and disgusted by her child's disfigurement, abusing her, despising her, keeping her indoors away from other people and children, not enrolling her in school, refusing to have the condition treated, and using Ada to do chores around their small flat. Ada cannot walk due to the severity of twisting but she has an active and agile mind and she yearns to go outside and to be around other people. An incredibly determined child, she eventually teaches herself to walk despite the terrible pain it causes. Her brother Jamie is good to Ada and when World War II starts and London children are evacuated to the countryside, he helps conspire for Ada to go too, even though she's not enrolled in school so not technically on the evacuation lists. Ending up in Kent, the children are billeted with an emotionally distant and uncommunicative woman named Susan who owns a pony that Ada learns to ride. Under Susan's care, Ada really starts to blossom and come into her own. Susan too starts to thaw with these children around. It is strange to think of something so terrible as the war as being beneficial to anyone but for Ada and for Susan, it is. This is a wonderful tale of coming to appreciate and value yourself, to make connections to others, and to learn to love or love again. The characters here are beautifully drawn and Ada's mother is scarily real. It might be hard for a middle grade reader to read about the terrible way that Ada is treated but the payoff in the end is so worthwhile. The story moves along at a good pace, with enough action beyond Ada's emotional maturation to keep kids turning the pages and the valuable lessons are not overt enough to be off-putting. A really great read, I look forward to seeing what my niblings think of it.